They look precious in their pearls! Mine always wants a cake like that for her birthday, I think she'd be mooning over it too! Too cute! You'll be able to embarrass them with that picture years from now. Allie, the god of cake, is a scream. However did you find her?!?!?! You do realize the twins have the exact same expressions on their faces in both pictures. One is all demure sweetness and light, and the other looks like she's about to pop with a fiendish secret plan. They look so grown up. 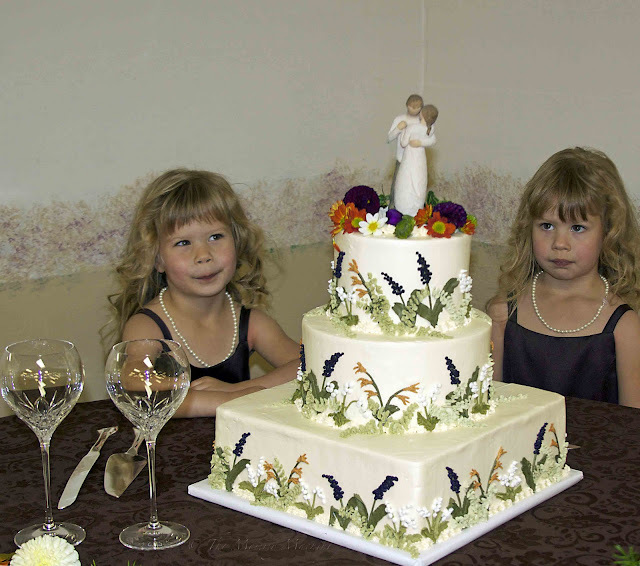 (and that would totally be my girls eyeing the cake, too). I can't get over how cute they are. But they do look like they can't wait to get their hands on that cake. Those are MY kind of girls! hahhahaha.... that is SO funny! i love the photo... i know exactly what they feel. now i know what i look like in weddings. hahhaa..
Oh my, gorgeous girls! And that cake---wow, I'd be parked there with them. :) Cute blog!!! OMG! Beautiful little ones!!! I could stare at them all afternoon! Great photo! Love it. Your blog is quite eye candy as well! Ha, so cute! Their faces say everything! Lol...so priceless......and what a beautiful cake!!!! I definitely want to read a bit more on that site soon. BTW, rather good design that blog has, but don’t you think it should be changed once in a few months? Don't you wish you could read their minds? ?